Enjoy the top 1 famous quotes, sayings and quotations by Felix D'Herelle. On opening the incubator I experienced one of those rare moments of intense emotion which reward the research worker for all his pains: at first glance I saw that the broth culture, which the night before had been very turbid was perfectly clear: all the bacteria had vanished ... as for my agar spread it was devoid of all growth and what caused my emotion was that in a flash I understood: what causes my spots was in fact an invisible microbe, a filterable virus, but a virus parasitic on bacteria. Another thought came to me also, If this is true, the same thing will have probably occurred in the sick man. In his intestine, as in my test-tube, the dysentery bacilli will have dissolved away under the action of their parasite. He should now be cured. Want to see more pictures of Felix D'Herelle quotes? 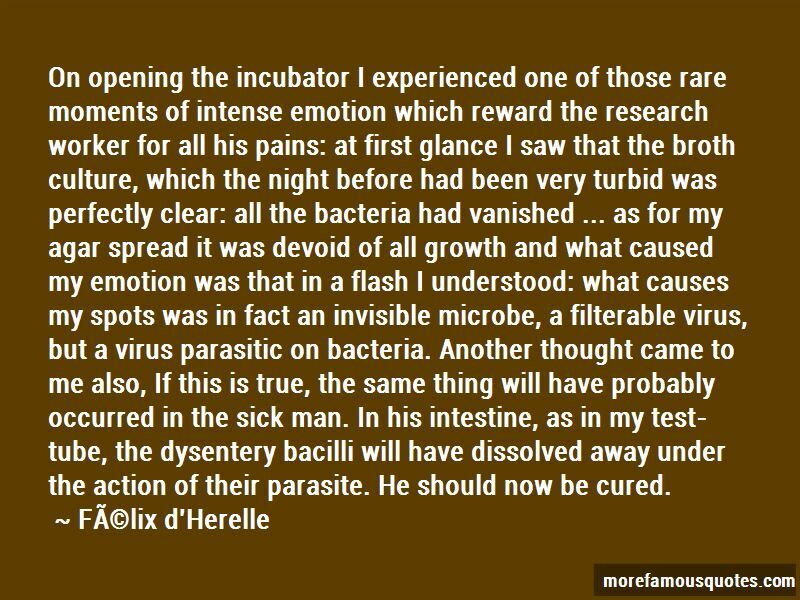 Click on image of Felix D'Herelle quotes to view full size.